In opposition to today's selfie culture and beauty standards marketed by mass media, Belgian artist duo Mothmeister created "Wounderland," where their surreal imagery depicts unnamed masked beings and taxidermy in barren landscapes. They've been collecting masks, taxidermy, and costumes over 25 years, and as a result, they say the transformation into their alter ego "Mothmeister" grew naturally. They respectfully use the taxidermied animals in their imagery as characters in what they call post-mortem fairy tales. Mothmeister works collaboratively from time to time with other artists, including French headpiece designer Candice Angelini, Russian fashion designer Polina Yakobson, the UK-based taxidermist, Adele Morse, as well as textile and mixed media artist, Annie Montgomerie also from the UK. 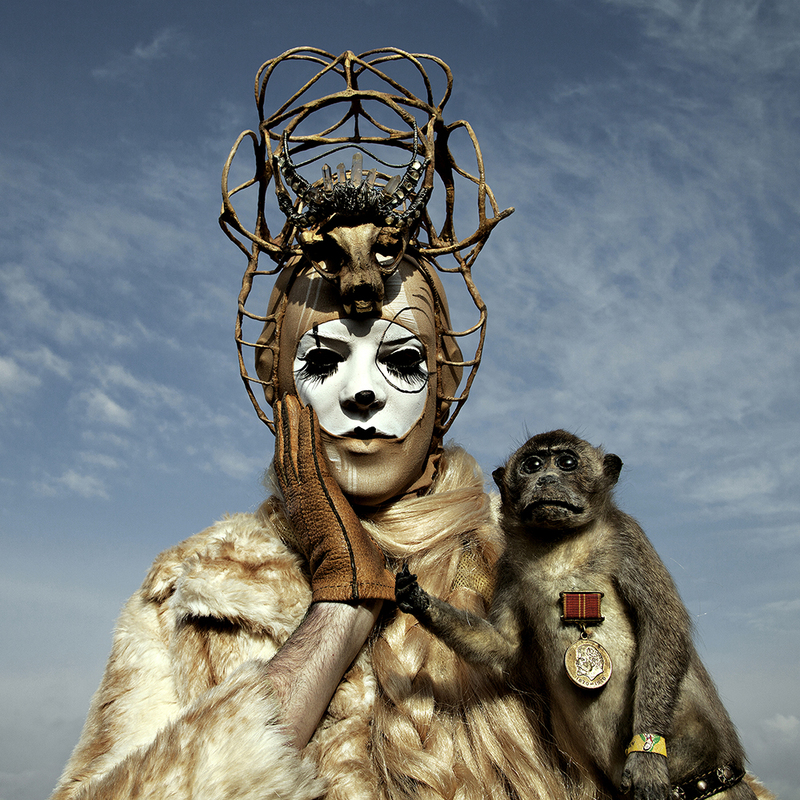 Both members of Mothmeister earned Master's degrees in graphic design from Sint Lucas School of Arts in Antwerp, Belgium. Joyce Brown: What’s the inspiration behind your art as Mothmeister? Mothmeister: Since childhood, we’ve both been fascinated by myths, legends, and fairy tales where animals possess human characteristics. We're intrigued by masks used in ancient rituals, religious cult celebrations, pest control protection, and carnivals. The transformation into our alter ego 'Mothmeister' naturally grew through the years simultaneously with our exploding collection of taxidermy, masks, and costumes. Joyce: Collecting taxidermy isn't something a lot of people do, so how did you get started? Mothmeister: Years ago we visited an Edward Kienholz exhibition. His work is a mixture of junk and taxidermy, and it inspired us — being poor art students at the time — to decorate our home in the style of Kienholz. We've been collecting taxidermy specimens for more than 25 years. A few years ago, we visited the dusty studio of a taxidermist who passed away and bought some quite shabby leftovers. Some of them don't even resemble any animal at all. Our favorite stuffed animals are the scruffy ones. We live in the center of Antwerp in an old and quite small 1930s apartment, and every room is filled from floor to ceiling. There's a decaying seal on top of a closet and a mummified cat on the toilet. Our home is like a Wunderkammer, a mishmash of an indoor zoo and cabinets of curiosities. We love to bring things together that aren't meant to be together. Living in our mad, stuffed, junk jungle stimulates us, and it's how our fantasy world called 'Wounderland' portraying taxidermy came to be. Joyce: Where do your photo shoots take place? Where is 'Wounderland'? Mothmeister: Wounderland is a no man's land, far away from ugly concrete cities. We prefer to shoot in barren landscapes, without any voyeurs around. We travel to remote locations on foot, packed like mules with all our costumes, taxidermy, and equipment. Sometimes it takes several hours to get where we want to go. For a shoot in Argentina, we first had a domestic flight from Buenos Aires, then rented a car and drove for a couple of hours, and finally reached the flooded ruins of Villa Epecuen. We shoot rain or shine. We let nature be the random factor of surprise in our work. Joyce: How do you hope people react to your photography? Mothmeister: Even though our imagery depicts dead animals, they become characters in what we call 'post-mortem fairy tales.' We don't portray famous fairy tales but prefer to create ones that tell disruptive stories. We try to achieve what the anthropomorphic taxidermist Walter Potter did: overcome the morbidity of the situation by adding humor and fantasy. Potter's dioramas, for example, were miniaturized fairy tales depicting mounted animals in a whimsical Victorian, or sometimes kitschy way. The animals were dressed as people and displayed to act like humans: gambling rats being raided by police rats, little rabbits busy writing on tiny slates in a classroom, kittens having a tea party, ice skating hedgehogs — all part of a Walt Disney World avant la lettre. Our imaginary world is one that people either love or hate. For us, it's our daily life and comfort zone, but we can imagine it would make some people feel uneasy. Our work is a respectful tribute to dead animals. We don't kill animals, on the contrary, we keep them 'alive' by immortalizing them in our world. Joyce: What’s your creative process? Who does what? Mothmeister: Most of our ideas are born from an instinctual gut feeling, rather than rational thinking. Our imagination, dreams, and nightmares feed us. We try not to plan or think too much because when we are spontaneous, we come up with ideas no one else has ever thought of before. Once we have an idea for a shoot, we just dive into our collection of costumes and masks and off we go. We are always the models in our photography. Most of the time the female is behind the camera, while the male is the one gasping for air in tight rubber masks or Victorian girdles. Joyce: Where do you get the costumes and masks that you use? Mothmeister: We find most of the costumes and masks at thrift stores, curiosity shops, and antique markets. But some of our stuff is bought online and tweaked in some way. Some we create ourselves. Apart from that, we've done some collaborative work with other artists and designers. It can take a while to get dressed, so the shooting is pretty intense. Some masks are extremely challenging to breathe through which means we need to shoot as fast as possible to not inhibit blood supply to the brain. But that's part of the game. Joyce: What do you do when you’re not working on your art? Mothmeister: We met many years ago in art school, and since then we've been living as artistic Siamese twins. One of us is a graphic designer and photographer while the other one is an art director, so storytelling and creating imaginary worlds is what we do. We are curious by nature, and that's at the heart of what drives us. UPDATE - 2/1/18: Mothmeister now has a new book! Check out the teaser video, then buy the book. Follow Mothmeister on Instagram, purchase postcards and prints at Mothmeister.etsy.com, or contact them at mothmeister@yahoo.com.